Among the brilliant and creative minds that surrounded Oxford during these early years at Cecil House was England’s first and most renowned modern scholar of Anglo Saxon (aka Old English) Laurence Nowell. A “northern man” from Lancashire, educated at Christ Church, Oxford, Nowell was in his early thirties when he came to Cecil House to tutor Oxford. 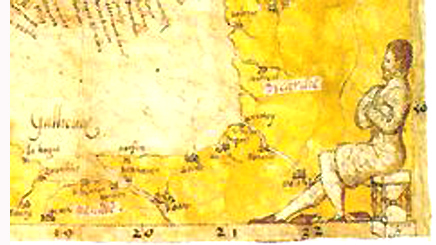 Apparently recommended to Cecil by Thomas Randolfe, probably in 1561, Nowell had traveled extensively, both on the Continent and to many parts of England and Ireland, possibly in connection with his interest in mapmaking. 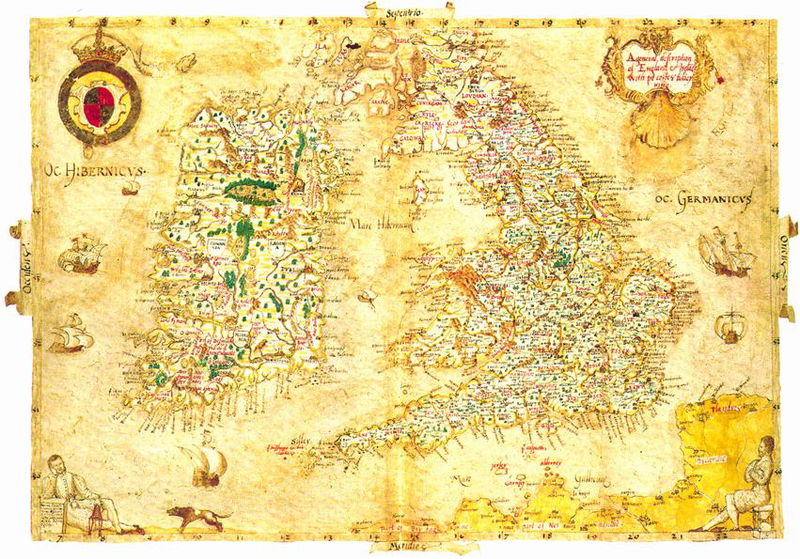 Something of an artist, while at Cecil House he created several beautiful maps, one of which, still in existence, is believed to be the pocket map that Cecil kept in daily use. Nowell’s map: Ornamental additions include most prominently the portraits of two male figures in each of the bottom corners. 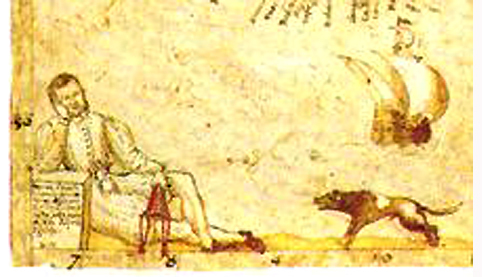 The reclining figure on the left, usually identified as Nowell, holding an empty purse and visibly distressed over being attacked by a baying hound, leans on a pedestal bearing a Greek inscription from Hesiod’s Works and Days stating that after Pandora’s opening of the jar “Hope was the only spirit that stayed there / in the unbreakable / closure of the jar, under its rim, / and could not fly forth.” The figure on the right, thought to be Cecil, sits with books scattered about his feet and rests on an hourglass beneath which another quote from Hesiod advises him to “hope and endure.” Nowell was also known for his “beautiful hand,” which is probably where Oxford learned his elegant italic script. Dates suggest that Nowell’s interest in Anglo Saxon arose in the early 1560s with his first contact with the ancient manuscripts then in Cecil’s and Archbishop Parker’s possession. Considering his artistic bent, it may have been the beauty of these, their witty little illlustrations of men and beasts and their meticulous uncials and ornate colored and gilded majuscules, that first captured Nowell’s interest. He seems to have taught himself to read Anglo-Saxon by comparing these texts with their Latin equivalents in Aelfric’s Grammar and Glossary, parts of which he would transcribe or translate while with Cecil. During this period he transcribed and translated into Latin a number of Anglo-Saxon texts, including the Old English Bede and parts of the Anglo-Saxon Chronicle. He had for some time in his possession, possibly through either Cecil or Parker, what is now BL, Cotton MS Vitellius A.xv in the British Library, the collection of Old English writings known as the Nowell codex which contains the only surviving text of Beowulf (on the back of which his name is written in pencil, along with the date, 1563). Commentators have noted the similarities between Beowulf and Hamlet. With what we know of Smith, his interest in Greek pronunciation and his post at Cambridge as Greek Orator, we can be certain that Oxford was familiar with the sound of ancient Greek poetry, with the lilt and cadence of Homer, Pindar, and Aeschylus, all found in Smith’s library. We can be equally certain that he was familiar with the sound of ancient Roman poetry, of Catullus, Virgil, and Horace. It seems likely that, with so many manuscripts of Chaucer around, plus the lingering use of medieval tropes in the more remote rural areas of England, he would have been familiar as well with the sound of Middle English. But what about Old English? What effect would hearing the aliteration, the throbbing cadence of Old English have had upon England’s future master poet? If this seems like an improbable scenario, we need to keep in mind that these men were already, or were fast becoming, expert translators. Years of immersion in many languages, moving back and forth from classical Greek to Koine (Biblical) Greek, to classical Latin to Medieval Latin, to English to French to Italian and back again, had given them a level of linguistic sophistication that few could top today. In addition, since Cecil House was a meeting place for ambassadors, couriers, and travellers of all sorts, from time to time visitors from Denmark, Sweden and Germany, also adept at translation, could have offered assistence with points of similarity between Old English and their own languages.. There can be little doubt that it was through Matthew Parker, Archbishop of Canterbury, that Nowell obtained the Chronicles manuscripts. Of the four manuscript versions of the Chronicles, all but one had come into the possession of St. Augustine’s Abbey in Canterbury at some point well before the dissolution of the monasteries, one at least was probably in its possession since the Norman conquest (Garmondswey xxxii). Notations on these manuscripts have been identified as those of John Joscelyn, Parker’s Latin Secretary, Parker himself, and Nowell. Joscelyn worked from a transcript of one of the four made earlier by Nowell “in or after 1565 but not later than 1567” (Dumville xiv fn. 25). During the period that Nowell was enticing de Vere and the rest of the Cecil House coterie with his studies in Anglo Saxon, also included was William Lambarde, then in the midst of legal studies at Lincoln’s Inn. According to his biographer, it was Nowell who first interested Lambarde in the work for which he would become renowned, translating the ancient Anglo Saxon manuscripts into Latin, a work fundamental to the study of English law (Dunkel 33). Perhaps it was the creative excitement of connecting clues from the OE texts with middle English texts, that the sound and cadence of Old English poetry was revived, a project that kept this wanderer with Cecil for as long as it took to get his friend and colleague,William Lambarde hooked, at which point Nowell took off again. He seems to have been something of a Will ’o the Wisp, one whose urge to see the world prevented him from staying too long in one place or spending too much time on any one project. Although a letter from Nowell to Cecil written in June 1563, suggests he was already thinking of moving on, the dates and the volume of his work suggest that he remained with either Cecil or Parker for another four years. On or about 25 March 1567, having named Lambarde as an executor of his will, Nowell set off one last time for the continent. While at the University of Paris, he sent his friend a transcript of yet another 9thcentury history, the Gesta Normannorum ducum (Acts of the Dukes of Normandy). After visiting Venice and Padua, he enrolled at the University of Vienna, but soon moved on to Basel. He was at Leipzig by August 1569, and in October matriculated at the University of Freiburg im Breisgau. By 1571, presuming him dead, his family petitioned the courts to order Lambarde to release their inheritances, which he did, though he retained the library Nowell had left with him, making use of his friend’s manuscripts and books in his own writings over the years. Nowell’s greatest legacy was his Anglo-Saxon dictionary, the Vocabularium Saxonicum, used in manuscript by generations of lexicographers until it was finally printed in 1952. (Yes, that’s no typographical error, it was not published until 1952!) Nowell also made the first critical edition of Alfred’s laws along with a modern English translation, which was used by Lambarde for Archaionomia, in which the material was presented in a way often seen in similar works today, a page of Anglo Saxon on the left faced by its Latin translation on the right. Lambarde’s Archaionomia, published in 1568, has given access to generations of legal scholars to the laws and customs of their Old English forbears, placing him among the great scholars of English jurisprudence..
Nowell has frequently been confused with his cousin of the same name who became dean of Lichfield. They had the same paternal grandparents. I used to be recommended this web site through my cousin. I’m no longer sure whether this submit is written through him as nobody else realize such unique about my difficulty. You’re amazing! Thanks!